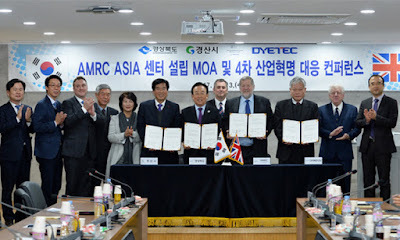 A partnership between the University of Sheffield's Advanced Manufacturing Research Centre (AMRC) and one of the most dynamic manufacturing regions in South Korea was praised by the UK government last week for its role in opening up new markets for British know-how and industry. Universities Minister Jo Johnson said plans for the AMRC Asia's Industry 4.0 Centre "represent the type of innovative growth the UK government has committed itself to in its new Industrial Strategy – building on mutual strengths for the creation of new industries and infrastructure that will boost productivity, competitive advantage and economic growth." With significant state of the art facilities on the Advanced Manufacturing Park (AMP) in Rotherham, the AMRC is a partner in the HVM Catapult (the Government's strategic initiative that aims to revitalise the manufacturing industry). It focuses on advanced machining and materials research for aerospace and other high-value manufacturing sectors. It is a partnership between industry and academia, which has become a model for research centres worldwide. Speaking following the signing of an agreement in Gyeongsan City by the AMRC's executive director, Professor Keith Ridgway, the Governor of Gyeongbuk province, Kim, Kwan Yong and the Mayor of Gyeongsan City, Choi, Young Jo, the UK Minister said this was an "excellent example of the science and innovation links" between the two countries and marked the "next important step forward" in making the new centre a reality. Professor Ridgway said: "Our ambition for the AMRC and the Sheffield City Region is to be a globally recognised centre of excellence for manufacturing research and innovation. But, to be a world leader in technology, you need access to world leading intellect. That's why we are working with our colleagues in Korea in a collaborative venture that will bring benefits to both our countries, and both our regions: Gyeongsan City region and the Sheffield City Region." The focus of the new centre will be on what is known as Industry 4.0, or the Fourth Industrial Revolution, which will see industrial digitalisation with the coming together of cyber networks, with physical networks, to create new autonomous systems. Ridgway added: "Our region was the home of the first manufacturing revolution and we are now leading the way in the fourth." "We recognise in Gyeongsan City a shared and very strong commitment to manufacturing and making things well. We also recognise a shared dedication to establishing a region of manufacturing expertise based on innovation and a commitment to be world-leading. And that is why we are so pleased to be planning this centre here. We are completely aligned in our thinking and can and will work closely together." Mr Johnson, added: "The AMRC is globally recognised as a leading centre for research into new manufacturing processes and materials development. The Gyeongsan Province is recognised for being home to some of the largest and most influential companies in their respective markets, including the steel, shipbuilding, energy and automotive industries, as well as the equally important cluster of innovative supply chain companies supporting these industries. "I am confident that this new centre, once established, will be an important creative nexus, not only facilitating new research and innovation breakthroughs, but new trade and investment links and opportunities between our two countries." The AMRC model has already been replicated in Denmark, Australia, Italy, the Netherlands, Germany and India. Work is ongoing to create AMRC Oman, the first of its kind in the Gulf.